SUREBOND-7000 Gloss Finish Joint Stabilizing Sealer seals the surface and bonds joint sand between interlocking concrete, clay and natural stone pavers. It also seals and protects decorative, stamped and patterned concrete that has been colored with integrals, acid-stains, release agents and color hardeners, as well as cast in place and pre-cast concrete. Protects colored, stained and exposed aggregate concrete from staining. Resists acid, salt, other corrosives and weathering while protecting against discoloration from damaging UV light. It can be used both indoors and outdoors on both new and old surfaces. 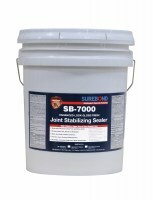 SB-7000 Gloss Finish Joint Stabilizing Sealer is water based, single component and epoxy-modified. It exceeds all VOC and EPA standards. The product is non-hazardous and has the consistency of water. It is milky white in appearance when applied, and dries crystal clear creating a semi-gloss finish. Where necessary, remove all curing compounds or visible signs of staining and efflorescence with SB-488 Efflorescence & Rust Remover. The pavement surface should be clean, dry and free from oil, dust and any loose material. If necessary, use SB-442 General Stain Remover to clean pavers (refer to label and data sheet for guidelines). If using on interlocking pavers, the paver joints should be completely filled with dry, correctly graded jointing sand with the top level not exceeding the bottom of the chamber or 1/8” below the surface on non-beveled or tumbled paver surface. A leaf blower is the recommended method to remove dust and fine sand particles from the surface and achieve the optimum joint sand height. For interlocking pavers, apply liberally and evenly with a siphon pump, bulk sprayer or hand-held garden sprayer. Flood joints to ensure proper sand penetration and stabilization and use a soft foam squeegee to direct excess material into the joints and to remove all excess material from the surface. For concrete, saturate the surface of the concrete and use a lambs wool applicator or paint roller to ensure proper coverage and remove any excess material from the surface. Use coverage guidelines to determine the correct amount of material for the project. Material coverage varies depending on surface porosity. 100-150 square feet depending on substrate porosity. Natural/Manufactured Stone 100 sq. ft.
Porous/Unglazed tile, Terrazzo 100-300 sq. ft.